The images of Mike Bouchet have long identified with notions of the cinematic. 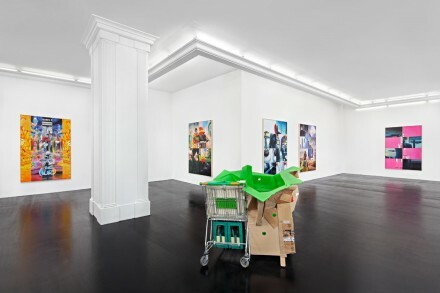 Whether it’s the artist’s simple paintings executed with his own home-brewed adaptation of Diet Coke, or his ongoing execution of celebrity-inspired jacuzzis, concepts of luxury, commodity and pop culture ideologies find themselves at a bizarre, yet often commanding, intersection. 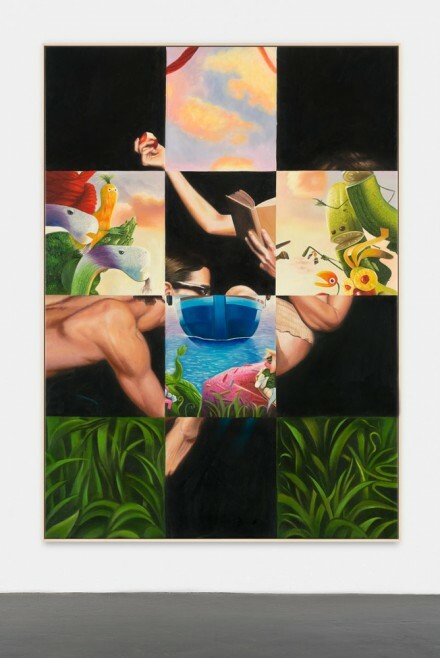 Bouchet’s newest work, on view at Peres Projects for his first solo exhibition with the gallery, is a fitting continuation of these approaches, taken to extremes of production and imagery that see the artist branching beyond the products themselves, and into their flow as signs in a global market. 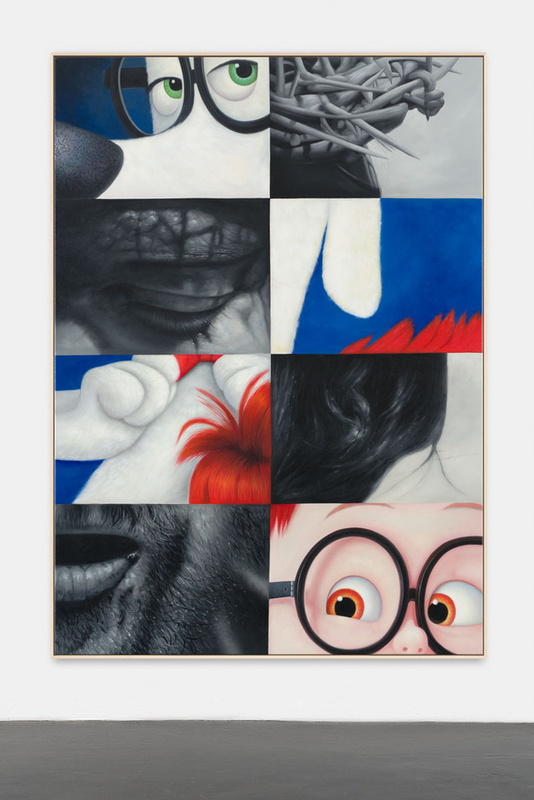 The show is dominated by a series of paintings, made by compiling celebrity images and movie posters with contrasting, occasionally absurd counterpoints. In one particularly charged work, the visage of Princess Diana is overlaid with that of a pickle, an irreverent action that immediately shocks the viewer into a realization of the cultural weight the princess’s image still carries as an ideological symbol. Other works approach the same techniques with a decidedly more absurdist, commercial bent. 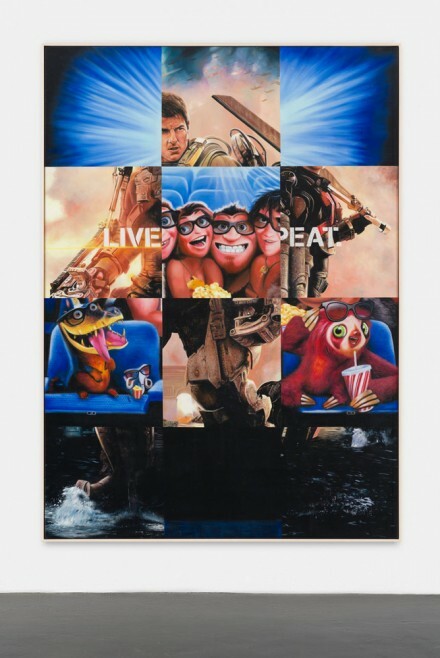 The artist has focused particularly here on the carefully composed movie posters of Hollywood blockbusters. Images from Cloudy with a Chance of Meatballs 2, collide with Tom Cruise’s stentorian gaze, while nearby, a portrait of Jesus is overlaid with elements from a Mr. Peabody and Sherman poster. As a result, the banal, overwrought image of Christ must contend with the contrived expressions of cartoons, an action that ultimately brings out the melodrama in both images, and causes the meanings of both to collapse under the weight of their own semiotic baggage. But perhaps the most interesting note of Bouchet’s show is the use of outsourced painting techniques. The works were actually executed in Asia, where the artist contracted out painters to build the photorealistic canvases rather than paint them himself. As a result, the images become part of an international conflict of meanings and methods, removing Bouchet as the authoritative author while still maintaining a hand as the operator of a tenuous mode of cultural reproduction. 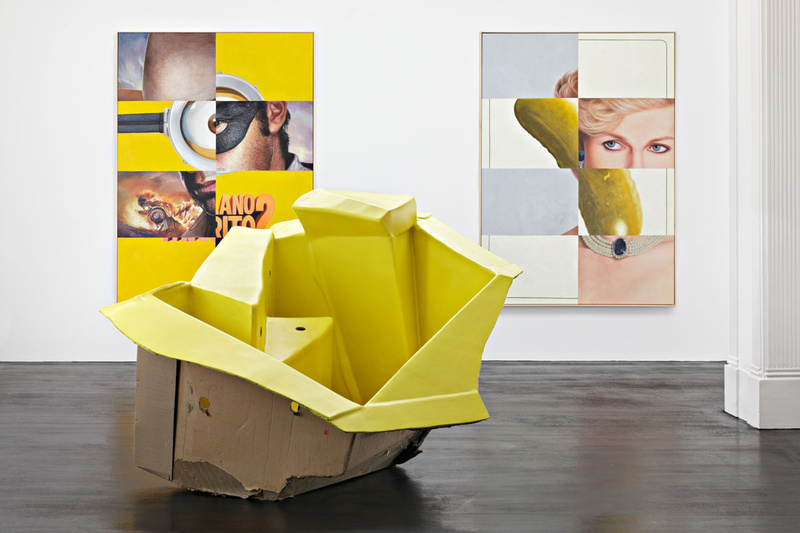 Alongside these pieces, Bouchet is showing a pair of jacuzzis created with Kim Kardashian and Elon Musk, jagged, colorful pieces that combine cardboard and litter to create a subtly abject commentary on the intersections of hard truths and luxury glitz that ultimately underly the production and consumption of art and culture at large. 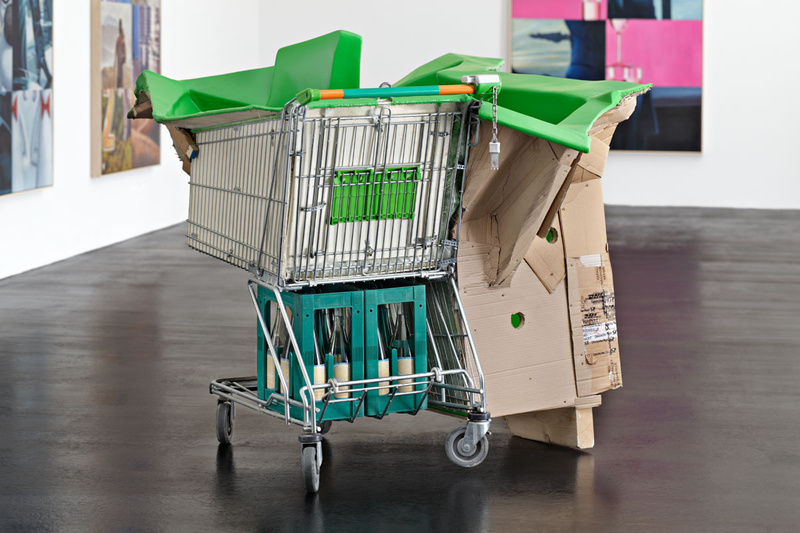 The show is a strong extension of Bouchet’s past work, and indicates an ever-increasing vocabulary for dealing with notions of cultural production and consumption beyond the object as such. One hopes that Bouchet will continue to push this envelope even further moving forward. Power Lunch is on view through November 1st. This entry was posted on Wednesday, October 8th, 2014 at 12:00 am	and is filed under Art News. You can follow any responses to this entry through the RSS 2.0 feed. You can leave a response, or trackback from your own site.